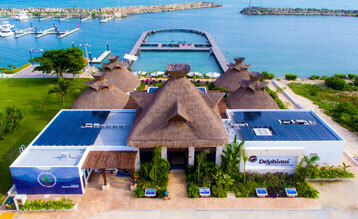 Delphinus has a total of 6 natural habitats and 1 interactive aquarium where you can enjoy the experience of meeting, swimming and understanding the life of a dolphin in a natural environment. Xcaret: an extraordinary natural scenery, a dream park and a great place to swim with dolphins. Xel-Há: this eco-park has everything, and we mean it. In addition to its many water activities and adventures, you can swim with dolphins. Puerto Morelos: it belongs to the second largest barrier reef in the world and has a special charm and history. 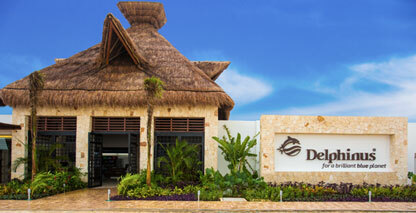 Riviera Maya: it is a world-famous place due to the color of its water and the softness of the sand. Playa Mujeres: Located in Cancun, within the Dreams Playa Mujeres Golf Resort and Spa, it is the only dolphin interaction in the world located on a beach. Punta Cancun: in the midst of the exclusivity of the hotel zone, surrounded by the Caribbean Sea, within the Hyatt Ziva of Punta Cancun. Interactive Aquarium Cancun: In addition to interacting with dolphins, you can meet and admire other marine species. Listen and learn: The Delphinus animal care specialists are very skilled and know everything about the physiology, habits and behavior of dolphins. They are always keen to share their knowledge with you. Your health is important: Although the experience is very emotional there’s physical activity involved, even though you don’t have to be an Olympic swimmer to enjoy the dolphin interaction program, you certainly do have to feel comfortable enough in the water to swim on your own. Wear only a swimsuit: Dolphins have a very sensitive skin. Don’t use sunscreen, oils or perfumes during your swim with dolphins because you could irritate their skin. Relax and enjoy: This is your opportunity to interact with an incredibly intelligent and caring animal. In Delphinus, the experts are constantly watching over you and the dolphins. You can hug them, kiss them and even go for a ride with them, and be confident that both you and the dolphin will have a great time.